THERE was a special school trip for the pupils of Fort Hill Girls in July 1971. The girls were ready to set off on a 15 day cruise on the SS Uganda, a special school ship with class rooms. The cruise would take the tour party to Corona, Malaga, Gibraltar and Lisbon before finally returning home to Belfast. IN JULY 1971, Lisburn's Chief Inspector Robert John Heslip was reported in the Star to have said Lisburn had a very serious drug problem. He said there were pushers in town police wanted to get at in a bid to protect young teenagers. IT was reported in April, 1988 by the Star that the long awaited opening of the new YMCA would happen within weeks. After almost a decade of planning and talk a local branch of the YMCA was poised to open its doors to the public. The premises in Market Square were to feature a coffee bar, lounge and several small group activity rooms. A special opening ceremony was planned for April 18. 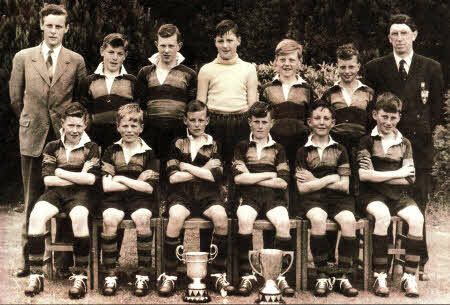 Members of the Lambeg Primary School football team who won the league cup in 1955 were William Shanks, John Neill, John McCormac, Jack Kennedy, with the League for the new season the principal Mr Tommy Priestley. Front row Kenneth McCabe, Jim Bain, Mervyn Law, Will Hunter, Jim Houston and Albert Ward. Looking on is teacher Mr Val Gough (back left). IN July 1971, angry residents of Diamond Gardens in Finaghy wrote to Prime Minister Brian Faulkner demanding the re-organisation of the Special Constabulary. Their area had been the scene of two bomb attacks within a matter of days and residents were in fear of their lives. Local councillors met with anxious residents after the attacks to hear of their concerns and what action they wanted taken. SIX new clubs were about to join the Lisburn Amateur Soccer for the new season the Star reported in July, 1971. Section A would contain 14 teams including newly promoted Millar United and Grove United. The three sections would have a total of 46 teams including Sparta after an absence of four seasons. Plans were being discussed to form a Juvenile League at some stage in the future. TWO multi-storey car parks were on the cards for Lisburn if the Department of Environment agreed to release land for private development the Star reported in April, 1988. This was the positive message delivered by Chamber of Commerce president Bill Watson to the Department's Under-Secretary at the time. Mr Watson said he was confident private business consortia would back and develop two multi-storey car parks in Graham Gardens and Hill Street. The Chamber had already highlighted the need to increase car parking spaces and to improve local roads as Lisburn was trying to off-set some of the economic effects following the opening of the Marks and Spencer store at Sprucefield that year. Mr Watson described the response as 'very positive and encouraging' but said at the time the plans still had a long way to go. He said: "As President I am aware equally of the need for concentrated car parking facilities and of the fact that there are businessmen in Lisburn who would be prepared to back the venture as a private concern. "The development is really too big for single business interests and I would expect consortia to tender for it." 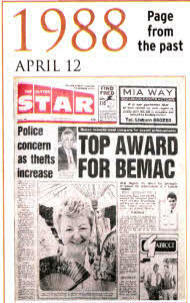 Bemac Engineering based on the Ballinderry Road were celebrating back in April 1988 when they were awarded the prestigious Queen's Award for Export and Achievement, only one of two companies in Northern Ireland to receive the honour that year. 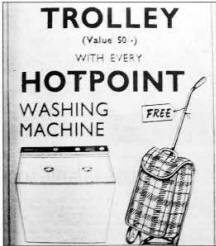 This was an offer too hard to refuse in the Star back in 1966 - a free shopping trolley with a new washing machine. STAR Sport reported in July 1971 that Sheffield Wednesday scout Jim Emery was looking for local talent. The former Distillery player was pin pointing Lisburn as a source of potential talent and he was certain he could find players who could make the grade in professional football. LISBURN schoolboy Colin Beattie became the fastest ever man ever in the history of the Ulster Swimming back in April, 1988. The 16-year-old Methodist College student ripped up the record books when he won the 100m freestyle at the Daily Mirror championships held at the Grove in Belfast.